Let’s talk about cake mix hacks! My pantry has its own boxed cake mix section because I use cake mix a lot in recipes. Once in awhile, I’ll follow the directions on the back of the box and use the product like its intended. That can get pretty boring though! Instead, I’ve been using cake mix as an ingredient in recipes. It can really jazz up a dessert and turn it into something special. Cake mix is for more than just cake! The question is what can’t you make with cake mix? Ok don’t answer that! But really, there’s so many ways you can incorporate cake mix into your baking. On my blog, I’ve been sharing a whack of cake mix hacks recently. I bought a bunch of boxes of cake mixes for $1 and had to use them up. I made cobbler, fudge, bars, cookies, a dump cake and more. If you search Pinterest for cake mix hacks, you’ll find a tonne of recipes! 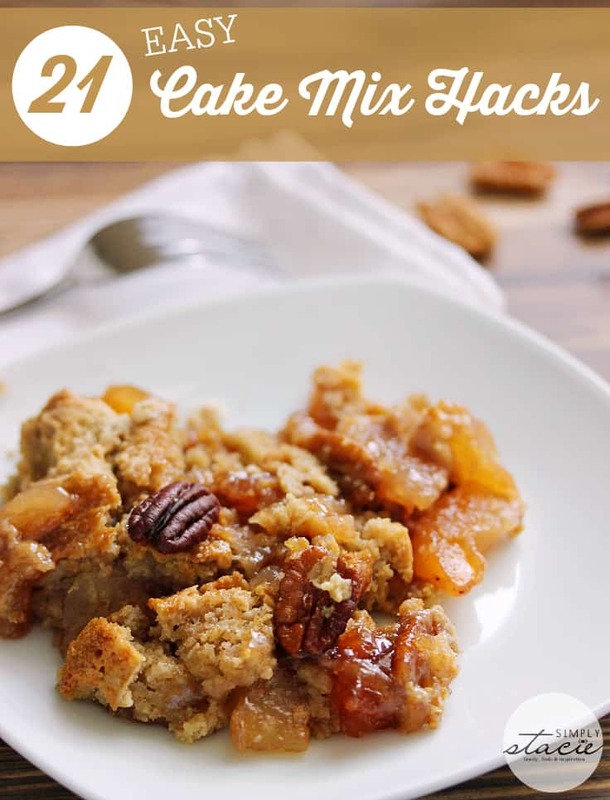 I’ve narrowed it down to 21 easy cake mix hacks with a few of my own and other yummy looking recipes I want to try. I’ll have to buy more cake mix if I want to try all these recipes! Hopefully, they have another sale soon…. I’d love to hear about your experience using cake mix in recipes. Do you ever make cake mix hacks? I am anxious to try some of these, especially the cake mix cobbler. I have used cake mix in a few recipes and it has turned out well, going to spend some time checking out the links above. I am always looking for new recipes to try! A small part of me wishes I didn’t come across this blog post. I’m always looking for new recipes to try and let’s face it, it’s kind of hard to resist the temptation when the recipes are as delicious as these look. I have been sprucing up cake mix long before Pinterest and cooking/baking blogs became popular. It all started with replacing the water and oil with milk and softened butter. I usually only stock (if I have any at all nowadays) cake mix in white, yellow and chocolate. Those the flavors I prefer and can easily be dressed up with things from your pantry or refrigerator. I mostly bake from scratch now but cake mix is useful for those occasions that you want to get the batter in the oven quickly, or you have recipes/preparations of certain recipes that call for it like gooey butter cake, or to make really soft cookies fast. These sound wonderful! I can’t wait to try some of them. I have really enjoyed your posts on cake mixes. They have been on sale, but I don’t always want a cake. It’s great trying new things and so easy, too. Pinning this page. Thanks. Are you kidding VRed Velvet Rice Krispie Treats? Holy I know I would love these! yum, going to try them this weekend, thanks! Wow, I had no idea that there are so many ways to use cake mix! Very cool. Some awesome recipes here Stacie, love using cake mixes for different recipes, thanks for sharing some great ones!! I want to try and make the easy lemon cookies! I have heard of using cake mix to make cookies but I had no idea that there were so many other ways to use cake mix. I have never tried any cake mix hacks, I have only ever used cake mix to make cake. Thank you for sharing this post. I would love to try the Chocolate Almond Cake Mix Bars. I love dump cakes. They are so good and so easy! These are super awesome thanks for these great cake mix hacks! I just hit one of those sales and was wondering this morning what to do with some of them, my daughter loves to make cupcakes but even she can’t make THAT many! I’m going to go look at these! Thanks for some great new ideas. I am always on the lookout for new recipes that don’t take a long time to make, Thanks again. Thanks so much for sharing these recipes with cake mix as the base. They sound great – thank you! Apples cut in pieces on the bottom. Sprinkle jello strawberry powder on top. Then sprinkle white cake mix to cover up the jello. Add 2 cups boiling water. Then cook in the oven 350° for about 45 min. Wow I never knew that there was so many ways to spice up Cake Mix! Thank for the Post, and the Recipes! So many tempting recipes! I’m definitely going to be picking up more cake mixes on my groceries trip. I think I’ll start with the Maple-Glazed Apple Crisp Cookies and make my way through all of them. Thank you for the recipes. I will have to try these out. Love these time saving recipes. This is such perfect timing, Staci! I was actually looking for cake mix ideas. I’ve made cookies from cake mix before, but nothing really fancy. One thing I really want to try- if I can figure it out- is how to use cake mix in a waffle iron to make a waffle cake. Then I’ll top it with ice-cream. In theory, it will be delightful! I spelled your name wrong. I DO know how to spell it, I promise. Long day, migraine, and I got a bit too excited over the cake mix hacks! LOL.